SAP Business ByDesign Provides the Right Software for a Medical Device Manufacturer. CeloNova Biosciences is a global medical device company that develops, manufactures and markets a family of products based upon its novel Polyzene F technology for patients with cardiovascular disease. After a previous and unsuccessful attempt in deploying a full scale management solution, CeloNova Biosciences sought the aid of Navigator to bring clarity and a stronger sense of effectiveness to their organization. With ongoing full-scale support, mixed with the strongest business management software available, CeloNova was able to increase efficiency while mitigating cost. Navigator’s cloud-based solutions powered by SAP help medical device companies just like yours achieve operational and financial excellence while strengthening collaboration with suppliers and customers. We are a perennial award winning organization with over 500 implementations worldwide. Our cloud-based, integrated applications will manage your operations like never before. Although CeloNova was able to successfully penetrate the medical device industry with a valued product line, the need to manage their growing business with greater transparency and efficiency was apparent.  CeloNova looked to Navigator to bridge that gap with the complete command of an end to end software management platform. 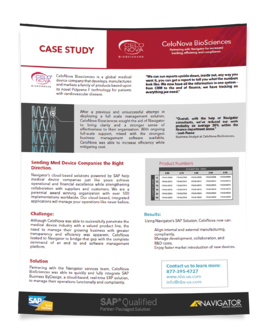 Partnering with the Navigator services team, CeloNova BioSciences was able to quickly and fully integrate SAP Business ByDesign, a cloud-based, real-time ERP solution, to manage their operations functionally and compliantly. Read what SAP had to say about Celenova's implementation of Business ByDesign.